On the latest Windows 10 ready version of Mailbird we have add another application that will help you send large attachment. Most email provider have a limit on the size of attachment that you can sent, by using Degoo in Mailbird you can send large files without any issue. Using Degoo in Mailbird is really easy, you only need to follow this three simple steps. 2. Click Degoo on the lower left of your Mailbird window and login to it. 3. You're done, now whenever you want to send a large files just drag and drop the file to the Degoo icon that you can find at the bottom of your compose window. 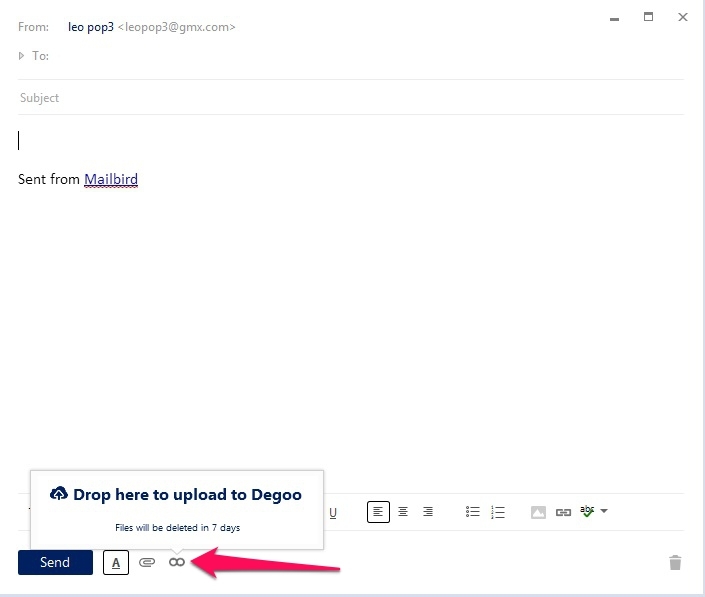 Whether you want to use Dropbox or Degoo to send your large attachment, it's very easy to do it in Mailbird. Here are some fact you need to know about sending attachment from Degoo. 1. Unlike Dropbox, you don't need to keep the files in your PC after you've sent it. You can delete it, move it, etc. 2. The file that you send does not need to be in a special Degoo folder, it can be from anywhere. There's a problem uploading the file in the Degoo, I'm currently uploading a mp4 file that I recorded with skype. The file size is 184mb. It say's uploading the file, after 5 minutes it has an error message closing mailbird crash etc... I try it many times but luck. Hi! Why does not al Dropbox can do that? Why does not it work? Why can't this be done with Google Drive? I don't trust or know this degoo thing, and since I use gmail, it makes sense just to use Google Drive's native integration to do this. Also, if an attachment fails to send due to size, it would be nice to get an error message stating that instead of it pretending that it sent.